This article is about the automobile manufacturer. For its car brand, see Subaru. 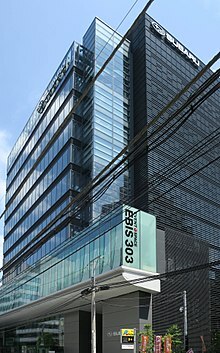 Subaru Corporation (Japanese: 株式会社SUBARU, Hepburn: Kabushiki-gaisha Subaru), formerly known as Fuji Heavy Industries, Ltd. (Japanese: 富士重工業株式会社, Hepburn: Fuji Jūkōgyō Kabushiki-gaisha) (FHI), is a Japanese multinational corporation and conglomerate primarily involved in both terrestrial and aerospace transportation manufacturing. It is best known for its line of Subaru automobiles. The company's aerospace division serves as a defense contractor to the Japanese government, manufacturing Boeing and Lockheed Martin helicopters and airplanes under license. This same division is a global development and manufacturing partner to both companies. FHI was incorporated on July 15, 1953, when five Japanese companies, known as Fuji Kogyo, Fuji Jidosha Kogyo, Omiya Fuji Kogyo, Utsunomiya Sharyo and Tokyo Fuji Sangyo, joined to form one of Japan's largest manufacturers of transportation equipment. By late 1980s, the company was a major supplier of military, aerospace and railroad equipment in Japan, but 80% of its sales came from automobiles. Sales in 1989 fell 15% to US$4.3 billion. In 1990, the company faced a loss of over US$500 million. Industrial Bank of Japan Ltd., the main bank of the company, asked Nissan Motor, which owned 4.2% of the company, to step in. Nissan sent Isamu Kawai, the president of Nissan Diesel Motor Co., to take charge of FHI. In 1991, FHI started contract-manufacturing Nissan Pulsar (Nissan Sunny in Europe) sedans and hatchbacks. Currently, the company makes Subaru brand cars, and its aerospace division makes parts for Boeing, helicopters for the Japanese Self Defense Force, Raytheon Hawker, and Eclipse Aviation business jets. In 2003, the company adopted the logo of its Subaru division as its worldwide corporate symbol. On October 5, 2005 Toyota purchased 8.7% of FHI shares from General Motors, which had owned 20.1% since 1999. GM later divested its remaining 11.4% stake on the open market to sever all ties with FHI. FHI previously stated there might have been 27 million shares (3.4%) acquired before the start of trading by an unknown party on October 6, 2005, and speculation suggested a bank or perhaps another automaker was involved. After the purchase, Toyota announced a contract with Subaru on March 13, 2006 to use the underutilized Subaru manufacturing facility in Lafayette, Indiana, USA as well as plans to hire up to 1,000 workers and set aside an assembly line for the Camry, beginning in the second quarter of 2007. In June 2014, the company entered into a contract with Boeing, as one of five major Japanese companies contracted, to build parts for Boeing's 777X aircraft. In May 2016, Fuji Heavy Industries announced that it would change its name to Subaru Corporation, with the change effective on April 1, 2017. The aerospace division is a contractor for the Japan Defense Agency and markets and sells both commercial and defense-related aircraft, helicopters and target drones. For the Japan Ground Self-Defence Force it has built the Bell UH-1 Iroquois, Bell AH-1 Cobra and Boeing AH-64 Apache helicopters. It will also be responsible for providing maintenance for the Bell-Boeing V-22 Osprey tilt rotor aircraft. This division previously built the FA-200 Aero Subaru and is currently participating in the Airbus A380, Boeing 777, Boeing 787, Hawker 4000 and Eclipse 500 programs, and supplies parts for Boeing 737, Boeing 747 and Boeing 767. The eco technology division manufactures and sells garbage trucks, robot sweepers, and wind turbines. Subaru discontinued the production of buses and railroad cars in 2003. Subaru discontinued the production of small engines in 2017. The former Subaru Industrial Power Products division manufactured and sold commercial engines, pumps and generators which were formerly under the Subaru-Robin and Robin brands. Discontinued in 2017, the Subaru Industrial Power Products division manufactured and sold commercial engines, pumps and generators which were formerly under the Subaru-Robin and Robin brands. Subaru's industrial products division, began manufacturing "Star" engines for Polaris Industries snowmobiles in 1968 but engine manufacturing operations ended in 1998 when Polaris Industries started to build their own Liberty two-stroke engines. Subaru remains an invested partner with, and supplier of pistons to, Polaris. Subaru has provided more than 2 million engines used in Polaris snowmobiles, ATVs, watercraft and utility vehicles. Subaru-Bell UH-X - Ongoing project to meet the JGSDF's requirement for a UH-1J replacement. Bell Helicopter is Fuji's foreign partner in the competition. A variant of the UH-X may also ultimately fill the JMSDF's recently (October 2014) revealed requirement for a New Patrol Helicopter (to enter service in 2022). ^ "Fuji Heavy Industries Adopts Subaru's Six-Star Emblem as New Corporate Symbol". Fuji Heavy Industries. 15 July 2003. Retrieved 2008-06-11. ^ Shimizu, Kaho (2005-10-06). "Toyota to buy Fuji shares in GM selloff". The Japan Times. ^ "Boeing enters pact with Japanese consortium for supply of 777X plane parts". Chicago Chronicle. Retrieved 12 June 2014. ^ Alexander Stoklosa (12 May 2016). "Subaru Parent Fuji Heavy Industries Changes Its Name to Subaru Corp". Car and Driver. ^ "News Release". Subaru Corporation. ^ "Small Engines - Pumps - Generators - Subaru Industrial Power". Subaru Industrial Power Products. ^ "Polaris and Fuji: A Long History of a Powerful Partnership". ^ "Corporate Profile". Subaru Corporation. This page was last edited on 20 March 2019, at 02:34 (UTC).